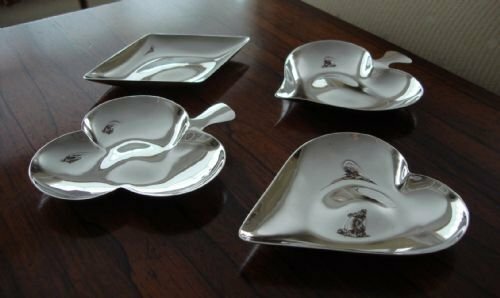 Beautifully designed solid silver English hallmarked set of 4 bridge or gaming counter dishes by famous maker A. E. Jones. 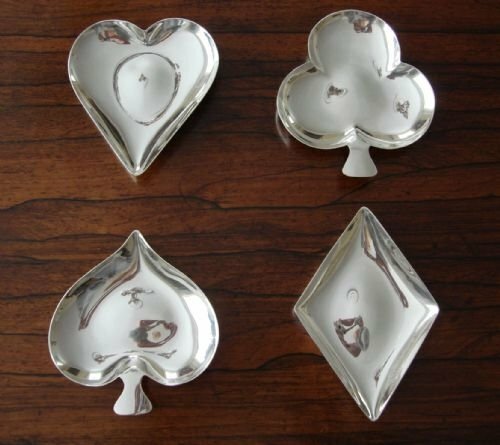 Solid silver English hallmarked very unusual and excellent quality set of 4 bridge gaming counter or trumps dishes in the shape of the four traditional playing card suits (diamonds, hearts, spades and clubs), hallmarked in Birmingham in 1986, and made by renowned makers A. E. Jones, in a heavy gauge of silver. The dishes are beautifully and realistically shaped, and have slightly convex centres. They are very suitable for snacks, nuts, and the like. 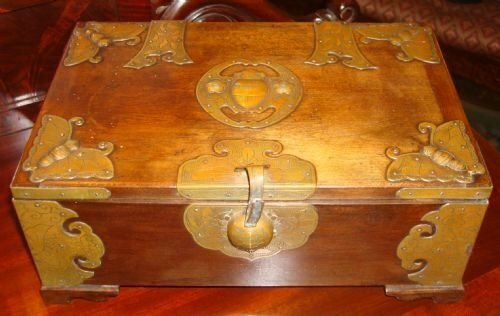 A. E. Jones, is a very well known and collectable maker of the Arts and Crafts period. He was born in 1878 and died in 1954. He came from a family of silversmiths. He trained at the Birmingham Central School of Arts, and became known as a developer and innovator . He was a Guildsman at the Birmingham Guild of Handicraft where he was influenced and inspired by the Arts and Crafts Movement. He went out on his own in 1902, and quickly became successful and attracted other talented artists and craftsmen to his workshop, all inspired by the Arts and Crafts movement. 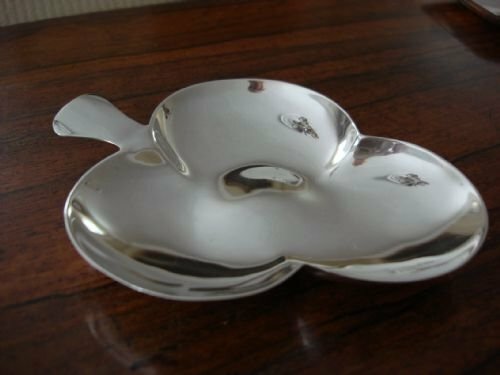 His silver was hand made, often also incorporating Ruskin pottery in the designs. In 1958 after his father's death, his son Kenneth Crisp Jones,(also trained at the Central School of Art Birmingham) took over the family business, continuing the firms great innovation in design and expression developed in the Arts and Crafts movement. 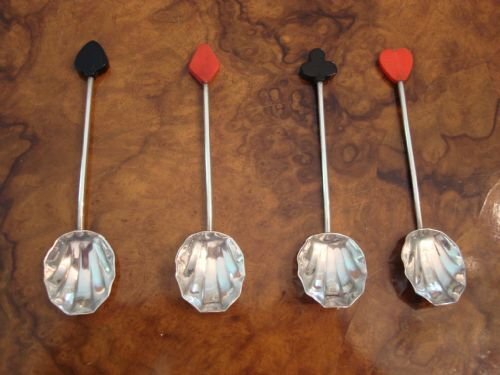 Size-Diamonds 4.75 inches by 3.25 inches; hearts 4 inches by 3 5/8 inches; spades 4 inches by 3.75 inches; clubs 4.25 inches by 3.75 inches. This is a set of beautifully crafted and unusual dishes, both stylish, functional, and of very generous size and weight. They would make a great gift for the bridge, trumps, card enthusiast, or any game using counters. 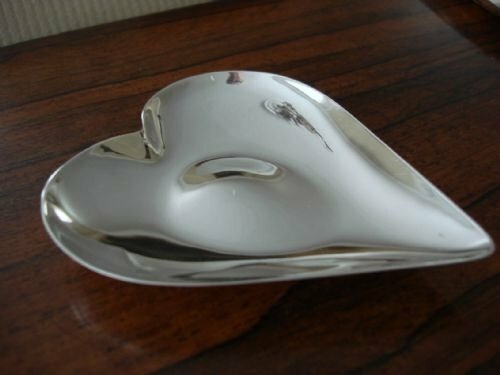 They are also lovely decorative pieces for the collector of novelty silver. Also see listings for cased set of playing card suit Art Deco silver and Bakelite spoons on www.serpentineantiques.co.uk. 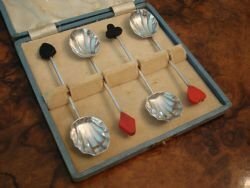 Art Deco period solid silver and Bakelite bridge spoons in the original case. 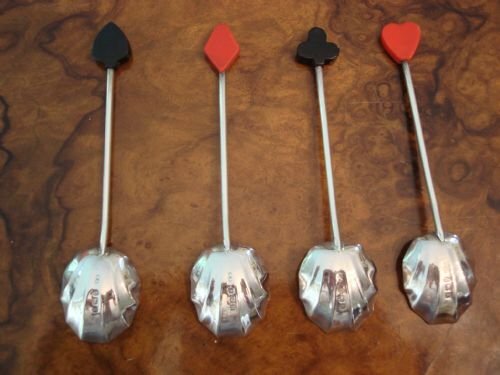 Birmingham 1932 English hallmarked set of 4 very unusual Art Deco period solid silver coffee or tea spoons with Bakelite terminals representing each of the four suits of cards (hearts, diamonds, spades, clubs). 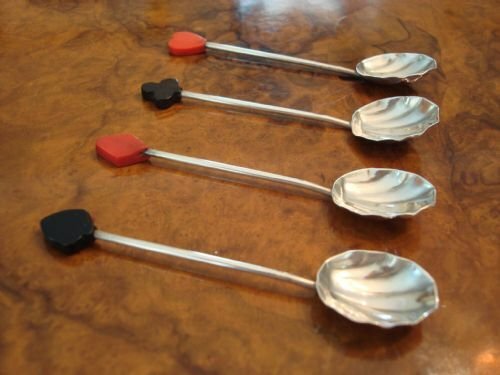 The Bakelite terminals are centrally mounted on the plain stems, so on whichever side the spoon rests, they are perfectly visible as seen. With pretty shell bowls, they are presented in the original fitted case. Made by Marson and Jones. Size-3.75 inches long by 7/8 inches wide. Weight-40 grams spoons, 115 grams with case for shipping. A great gift for the bridge, whist, or cards player. In very good condition overall, with just some minor age cracks to the Bakelite. 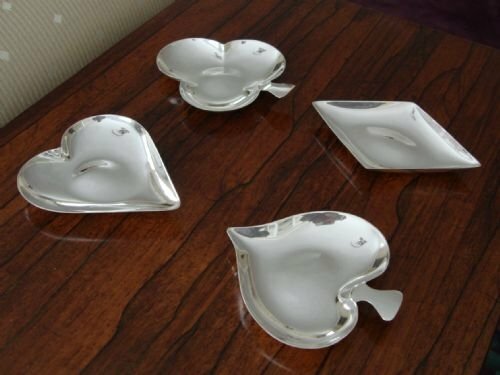 An unusual set, and very iconic of the Art Deco period. 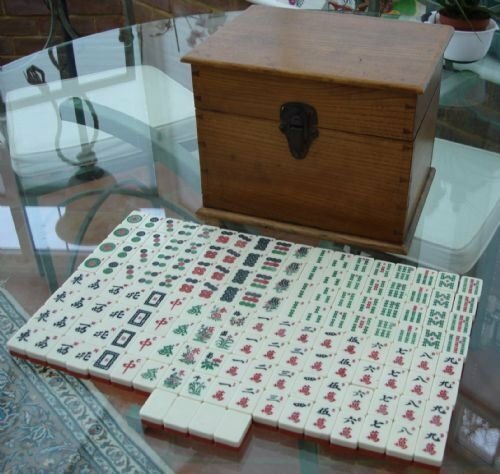 1930's bone and bamboo 156 tile large and complete mah jong set with exquisite quality tiles and the original box. 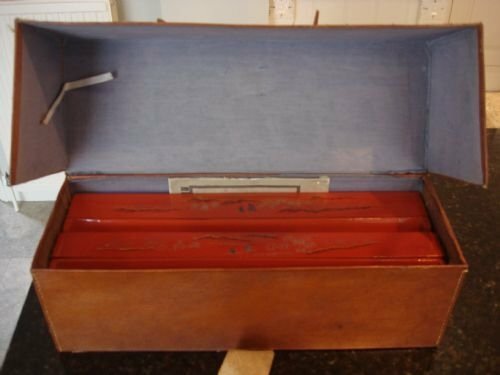 1930's complete bone and bamboo mah jong set with wonderful quality tiles, fitted into the original multi drawered hardwood box. The 156 tiles have an unusually deep bone layer dovetailed into bamboo and are very nicely carved. 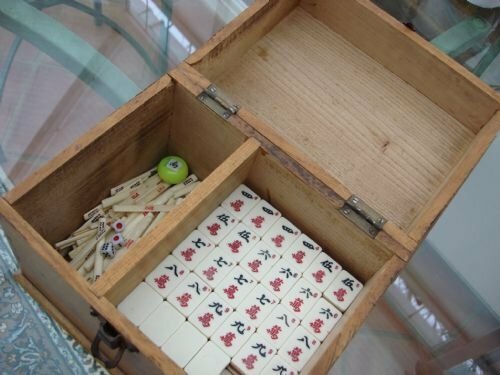 Unusually, they include everything required to play the many versions of mah jong including both Chinese and American styles of play. Chinese style only requires 144 tiles. This set has 12 additional tiles, including 8 additional flower/season tiles and 4 extra blank tiles. Also included are bone counting sticks, a wind indicator disc, a set of 4 tiny bone dice in their original wood box, and 3 larger dice. They are all contained in the original 5 drawered hardwood box that has been professionally restored. It is missing some of the original brass embellishment, and the sliding cover is a bit warped. However, it is sturdy and nicely polished. It works well to hold everything beautifully. Size overall-9.5 inches wide by 6.5 inches deep by 6.25 inches high. Size of individual tile-1.25 inches long by 7/8 inches wide by 9/16 inches deep. antique sets with this number of tiles are rare to find. Tile racks are available if desired, as well as mah jong, dice and domino jewellery. Please enquire. 1920's lovely original bone and bamboo complete mah jong set in great box embellished with bats and insects. 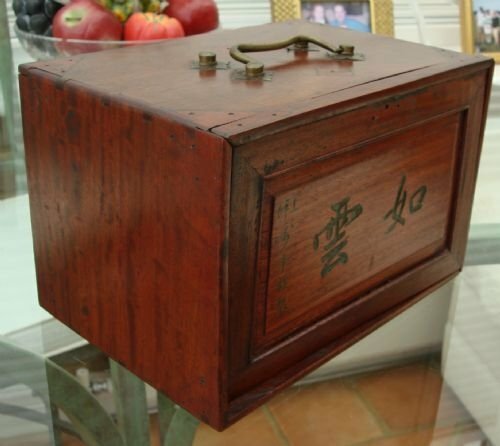 1920's wonderful and original complete Chinese mah jong set in an unusual hardwood box, with hinged rising lid, and embellished on all sides with gilt metal applied decoration consisting of bats and butterflies, symbols of good fortune to the Chinese meaning happiness, wealth and great age. 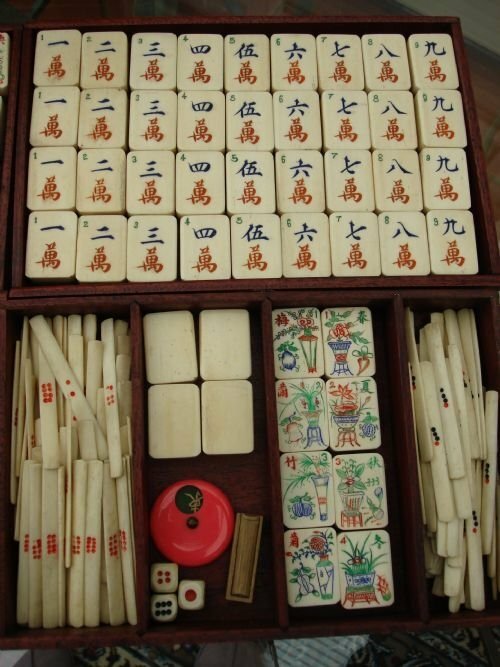 The set contains 144 bone and bamboo dovetailed tiles, a full set of bone counting sticks, a wind indicator disc, 2 pairs of bone dice, and the original instruction booklet. As is the case with very good quality tiles, the 1 circle tile has a different symbol in the middle of each one. If you play with flower and season tiles, this set comes with 8 blank ones, also confirmed in the instruction booklet. Size of tiles-approx. 1.25 inches high by 7/8 inches wide by .50 inches deep. 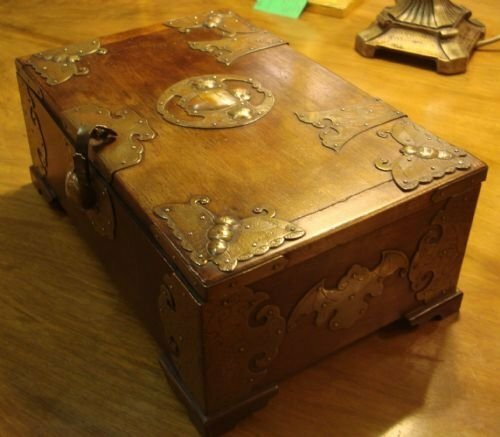 Size of case-11 inches long by 7.25 inches wide by 4.25 inches high. A wonderful and collectable set to play or display. In very good condition, you will find that there is nothing like playing with an antique set. These sets are very popular and sought after. Tile racks are available if desired, as well as mah jong, dice and domino jewellery for the gaming enthusiast. Please enquire. Great quality complete mah jong set in dovetailed elm box. 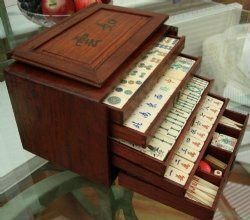 Wonderful complete vintage mah jong set with 148 tiles, in beautiful bespoke elm wood box having hand made dovetails and with a divided interior. The two tone tiles are complete with the usual 144 tiles, plus 4 additional blank tiles, making a total of 148. Also included is a wind indicator, 3 dice, and a set of bone counting sticks. Size-box, 9.75 inches long by 7.5 inches wide by 7.5 inches high. Tiles each 1 1/8 inches long by 13/16 inches wide by 9/16 inches deep. 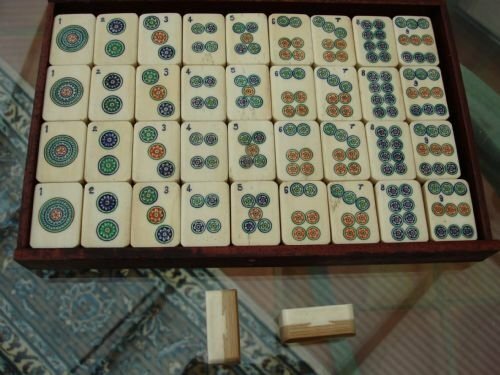 The whole set is complete and in very good condition, and would make a great gift for the games collector, a mah jong enthusiast or someone who wishes to learn. The box makes a very attractive display piece as well. Tile racks may be available if desired, as well as mah jong, dice and domino jewellery. See listings. 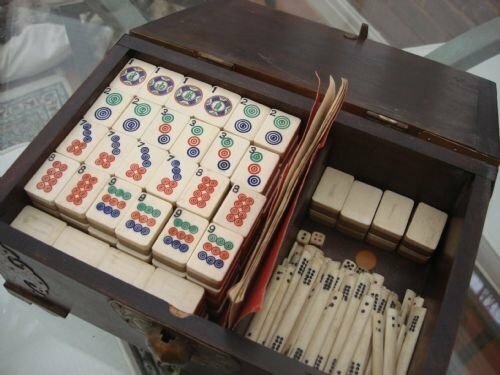 1930's complete Chinese mah jong set including bakelite tiles and generous sized lacquer tile racks in the original case. 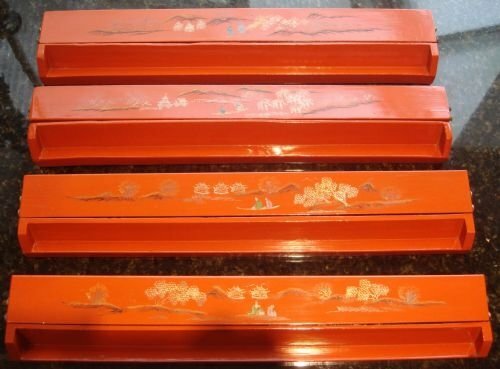 1930's original and complete Chinese mah jong set of 144 two tone bakelite tiles, plus a seldom seen set of 4 generous coral coloured and lacquered tile racks gilded and painted with similar but differing landscape designs to each one. Each design also includes two different figures painted within each landscape. Therefore, each individual player has a unique rack. 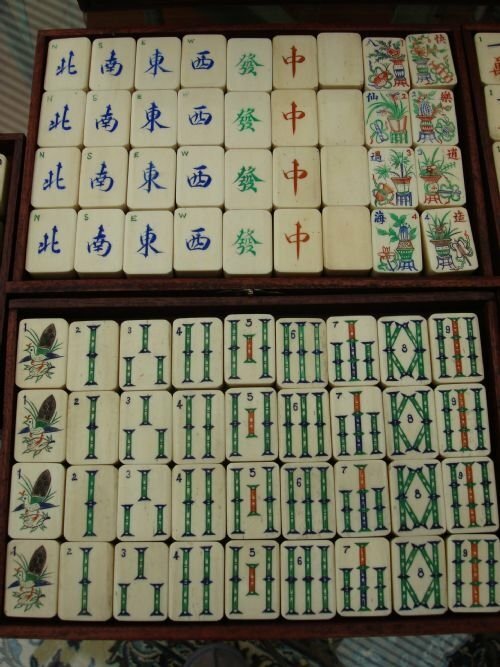 It is uncommon to get tile racks with a mah jong set, and these have good value on their own. Also included is an old mah jong generic instruction booklet, and a large set of bone counting sticks. All the pieces stack within the original carry case with working clasp. The tiles are yellow bakelite having a green back, and are complete with flower and season tiles. They store in 4 individual fabric covered tile trays within the large case, are attractive, and in very good condition. Tile size-1 3/16 inches long by 14/16 inches wide by 9/16 inches deep. The racks have a hinged top revealing storage inside, for counting stick use if desired. They are much more generous in size than modern versions which don't hold many sticks. They stack perfectly into the case, along with the trays of tiles. Tile rack size-16.5 inches long by 3 inches wide by 1.5 inches high. 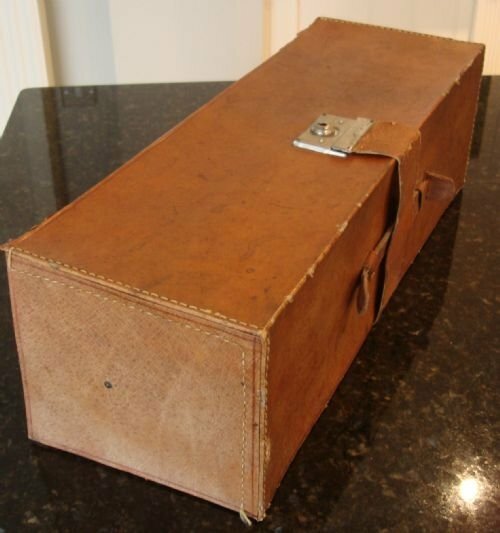 The case is also original to the set, and is a leather type covering with blue fabric interior. Case size-17.5 inches long by 6.25 inches wide by 5.5 inches high. One original tile has a replacement flower decal. 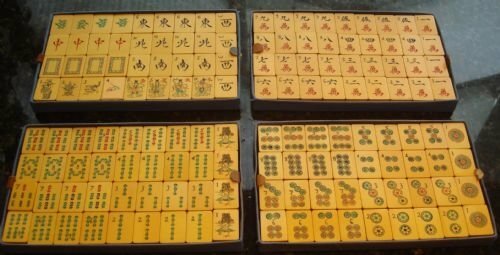 In very good condition, this is a most unusual mah jong set that will surely delight both the collector and player of mah jong. It is wonderful to play with an antique set. Additional lacquer and wood tile racks and counting sticks are available, as well as mah jong, dice and domino jewellery for the gaming enthusiast. Please enquire. 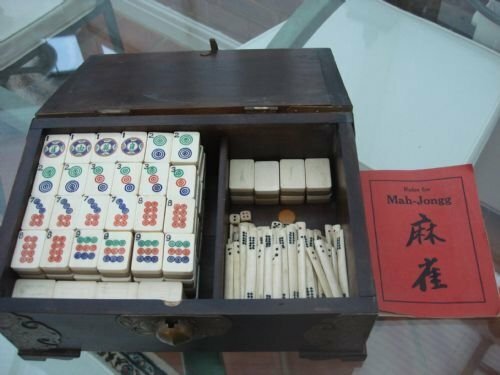 1930's complete cased set for mah jong, included tiles, tile racks, wind indicators, dice and original instruction booklet, by the very famous game makers J. Jaques and Son, in business since 1795, and still a family enterprise. The company has confirmed that this is one of their authentic 1930's sets. All of the above, including the racks, neatly fit into an ash dovetailed baize lined case, with the tiles held in interior removable ash tile trays. It is rare to find such a complete all original set, also including racks, particularly from such a renowned maker as Jaques and Son. Vintage stunning mother of pearl inlaid, lacquer and ivory chess set. Vintage lacquered and mother of pearl inlay hinged chess board with 32 ivory playing pieces. The folding lacquered board is inlaid with mother of pearl squares in the design of birds, boats, landscapes or flowers. There is also mother of pearl line inlay to the border. The board has a moulded edge. 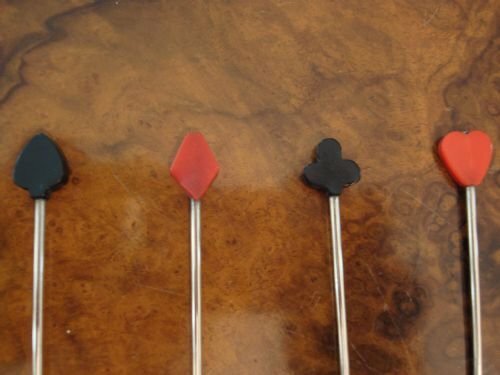 The playing pieces are all carved ivory, 16 being natural colur and the other 16 dyed. They store inside the board when it is folded and latched in the closed position. 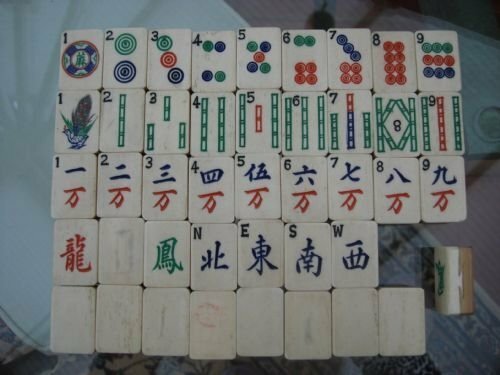 To play, the board is opened out flat, and is then ready to use. Size-board is 15 inches square; the king stands 3 inches high, the queen stands 2.5 inches high. A very lovely complete chess set to use and display, making it both practical and a beautiful and decorative accessory. 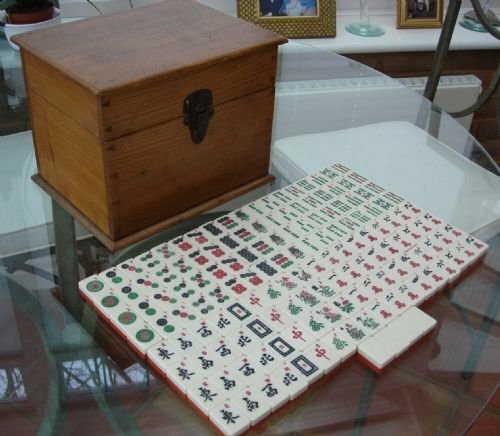 1930's complete mah jong set including 144 bakelite tiles, bone counting sticks, bakelite dice and instruction booklet in lovely hand painted lacquered box. The tiles are very tactile, and make a lovely noise when being "twittered" or mixed. Bakelite is also very collectable. Box top lifts off to display set. It is embellished both on top and bottom with birds and flowers. It is very unusual. Size of case-10.25 inches wide by 8.25 inches deep by 3.5 inches high. Size of tile-1 1/8 inches long by 7/8 inches wide by .50 inches thick. In very good condition, this is a lovely and complete set. Tile racks are also available for purchase if desired. One set is listed on the site. Other types are also available. Please enquire if interested. 19th century antique solid oak complete chess set. 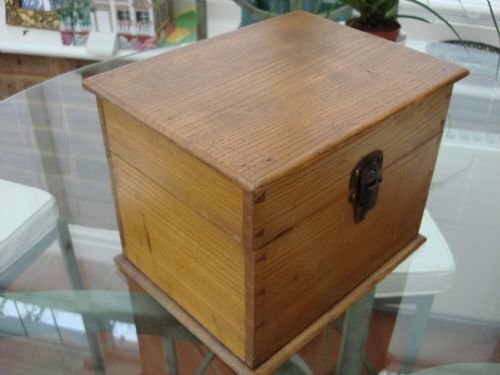 19th century antique square solid oak complete chess set with box having built in chess board top, and a drawer holding the 32 turned wood Staunton style pieces. Very well built set has raised moulded edge, and black painted squares to top. 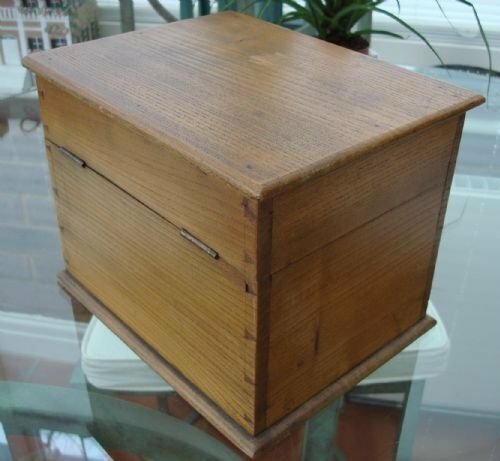 The deep drawer has the original pull ring and is neatly hidden in the side when closed. Size-12 inches by 12 inches by 4.5 inches high. The height of the King is 3.1 inches. A lovely antique set in very good condition, which will make a great gift.